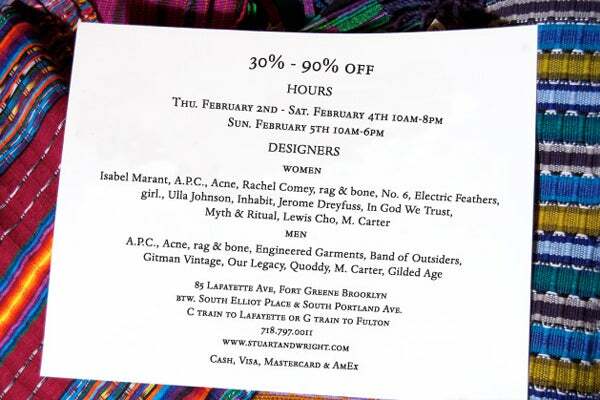 So, you've probably already moseyed on down to Fort Greene to shop the incredible selection of clothes that Stuart & Wright offers. After all, it's hard to say "no" to a shop that sells A.P.C, Rachel Comey, rag & bone, In God We Trust, and even a little vintage. Well, it's getting even better: Stuart & Wright is having a little sample sale starting this Thursday, where you can score 30-90% off their designer duds. That's right, we said up to 90% off your favorite clothes, shoes, and bling. You know this one is an absolute can't-miss, so hop on the C or the G train to scout out their very best deals before it's all over on Sunday. When: Thursday, February 2, through Friday, February 3, from 10 a.m. to 8 p.m.; Sunday, February 5, from 10 a.m. to 6 p.m.